10 hours left before the deadline and we're through. 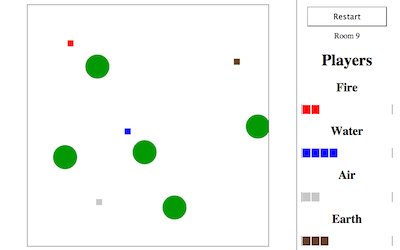 We submitted our game "WoE - War of Elements" for js13kgames this night. It's a multiplayer game you can play with your smart phone. But the fun thing is, you can sit near to each other, while playing agains each other. To start a game just open a new room on you desktop computer or any device with a big screen (as long as it supports websockets :-)). Then you can join the game with your mobile phone. Touch the screen and tap the circles before an other player can tap it. The first player to 10 points will win the round. WoE is a prototype using node.js and socket.io to run. It looks like a prototype and sometimes it feels like one. But it's a good start. And you can find the code at github: https://github.com/codelooksgood/woe.